Learn about our instrumental (flute, percussion & trombone) instructors below. symphony’s Grammy-winning CDs. 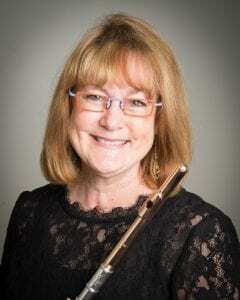 She has recorded with many well-name artists, performed/presented at National Flute Association conventions, written articles for Flute Talk, and loves playing and organizing chamber music. privately in Europe two years. Her teachers include Walfrid Kujala of the Chicago Symphony and Peter Lloyd of the London Symphony Orchestra, and master class participation with international soloists James Galway, Jean-Pierre Rampal, and Andras Adorjan. She and her NSO bassist husband Glen Wanner have co-authored two popular bicycle guide books Bicycling Middle Tennessee and Bicycling the Natchez Trace.